We’ve been in a wide variety of Austin venues that all have something unique to offer, but ultimately décor is needed to transform the space into a place that’s ready to party. When we throw casino parties in Central Texas our games, slot machines and professional card tables become part of the festive décor. However, that’s just scratching the surface of what’s possible. Here are a few of our top tips for pulling together killer décor, whether you’re decorating a hotel ballroom or a company break room. No high school prom committee is crazy enough to leave all the decorating to one person, and you shouldn’t either. Enlist the help of at least a few other creative people to create your own decorating committee. Coming up with a theme, gathering supplies and putting it all together in time is much easier when you leverage manpower. Mismatched, haphazard décor rarely looks good even in the most spectacular venue. It’s always best to have a party theme in mind before you begin buying decorations. The theme will help everything look cohesive and can make the planning process go a lot smoother. Two things to consider when you’re dreaming up a theme are the guest list and the purpose of the party. Never underestimate the power of lighting. With the flip of a switch, you can make an event space look completely different. Give your party venue a test run to see what lighting options are available. Make a note of whether the lights can be dimmed and whether gels can be used to change the tint of the lights. If the lighting options are extremely limited you may want to consider adding a few extra light sources. For example, we rent out colorful uplighting and table lights that add an element of fun. Starting with a clean slate (or as clean as you can get it) will allow you to let your decorating creativity flow. Consider all the different ways the space can be used and come up with several layout options. If the venue is large, find ways to create a variety of spaces. Sometimes a unique layout is all it takes to make the décor pop. Have you ever wondered why upscale restaurants have such fancy entrances? It’s because they know first impressions matter. Make the entrance the primary focus of your decorating to wow guests as soon as they arrive and immediately immerse them in the experience. Every event needs seating for the guests. You can use this as an opportunity to add to the décor. 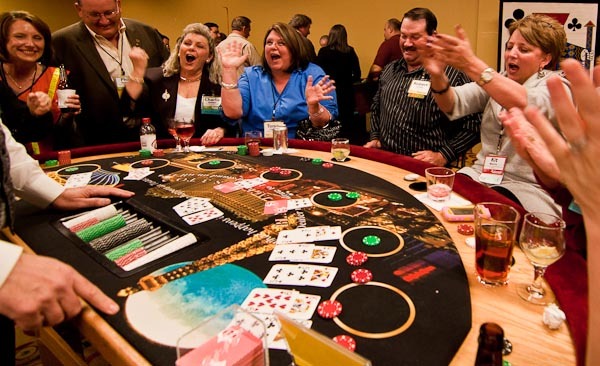 For instance, during our casino parties, the poker tables add to the ambiance and give people a place to sit. Want to have a western theme? Use hay bales for bench seating. Want to get people interacting? Try family style seating with decorative centerpieces. There’s something immediately eye-catching about décor you can consume. It’s also a great way to maximize your budget since food displays double as catering and decorations. Whether it’s an artistic employee or a creative professional, a local artist can add a special touch to any event. If you agree to promote the artist they may even lend you their artwork for free or create custom art for the event. When you hire Casino Knights Inc. our party planners will help you make décor decisions that add to the fun and festivities. Give us a call to discuss your casino party décor ideas!